The enormous benefits of digital marketing can be summed up in one word: personalization. E-mail, advertising and mobile marketing are honing their techniques to provide content that is increasingly targeted at individual recipients and tailored to each customer’s interests, habits and behavior. A level of personalization that undergoes two key activities: profiling and segmentation. The first prepares the data and information used by the second. Simply put, profiling is the pre-requisite for optimum segmentation. The act or process of extrapolating information about a person based on known traits or tendencies. According to a study by the Aberdeen Group, on average, personalized emails improve campaigns’ click-through rates by 14% and conversions by 10%. So far from being a key activity just for brands, profiling and segmentation allows recipients (whether clients or users) to only receive relevant communications in line with their interests, needs and availability. Avoiding generic emails is crucial for both sides. If an email is promoting an offer for a specific store in Miami and is sent to a recipient in New York, who benefits? Nobody. In this blog post, we want to shed light on the first task by discussing the user (auto)profiling tools available to marketers to give contacts the option to update and complete their profile. This way, they can provide both customers and prospects with only relevant and effective communications. Like data collection, profiling is also regulated by law. We’ll use this opportunity then to sum up how profiling is defined by the new European Privacy Regulation. Lawyer Marco Maglio explains this to us in this dedicated blog post. The Preference Center is a panel of the MailUp platform that functions as a webpage, which your contacts can land on to complete and update their profile, independently and at any time. Information on user activity (email openings, clicks, device used and geolocation). In the footer of all emails, always giving your contacts the chance to update their profile. In a dedicated email: The object, header and call to action will then be specifically geared towards inviting the recipient to update their data. In this case, a coupon or other benefit (like free shipping) can be used as a key incentive. In welcome emails: After thanking recipients for signing up to the newsletter, you can devote a second block of the email to direct them to the Preference Center: the modular design and BEE drag & drop features will help give your email a clear and functional structure. 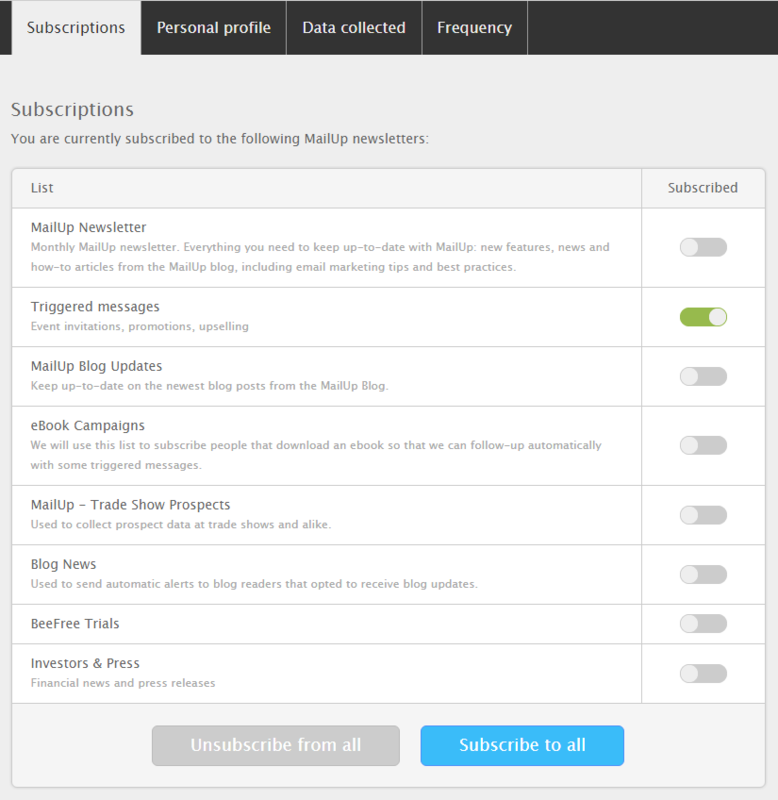 In unsubscribe confirmation emails: Every time one of your recipients chooses to unsubscribe from your database, you can re-launch the invitation for them to decide in detail the type of mailing, frequency and communications they wish to receive. These are just some examples: the link to the Preference Center can be tailored to all needs, precisely because it (also) benefits those receiving the communications. That’s why we encourage you to take a close look at your editorial plan and decide which mailings you’ll use to renew your invitation to recipients to update their profile: just one click is all they need to access a dedicated auto-profiling page. While the Preference Center is where your contacts can fine tune their relationship with brands, there’s also another tool that allows brands to gather more specific information: the profile updates form. Companies can use this form to ask targeted questions and receive equally precise answers to achieve even more refined profiling. There are so many examples of how a profile updates form auto-profiling form can be a useful tool in all trade sectors, from e-commerce through to retail. Once you’ve defined the structure, you can fine tune the form with a title, description, call to action and background color. Also, if you want to achieve a greater degree of personalization and align the forms to your brand identity, you can choose the Customized Solution option. In addition to the creative support for campaigns and profile updates forms, this also gives you a range of strategic advice and targeted activities, from deliverability to integrations. While the first field of the form gives recipients the option to change their address (on an average year, 30% of users change their email address), brands can use the later fields to request the most useful information for the following segmentation stage. 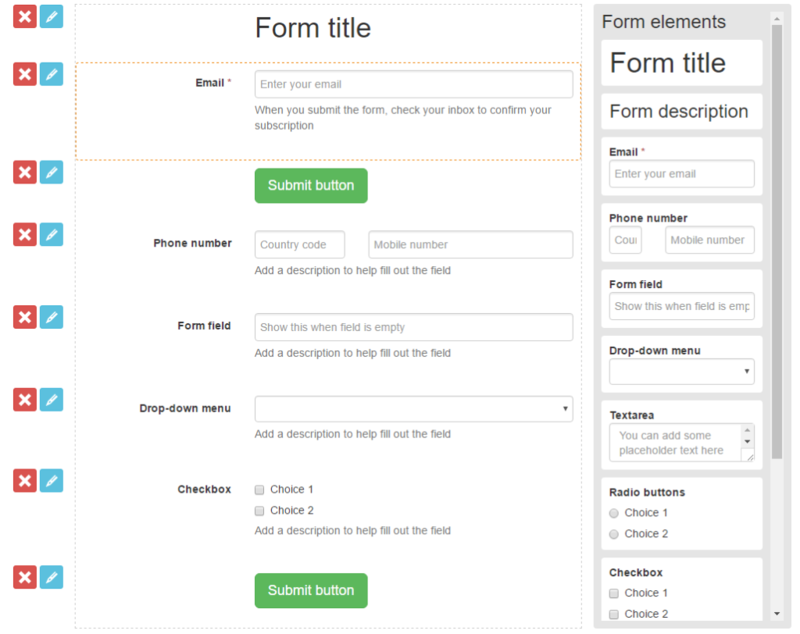 In this example, the forms can include many fields. But we recommend asking your contacts just a few precise questions so that you only receive information that is strictly necessary, leaving further profiling to a later stage. The golden rule is: the form should not take more than a minute to fill out. As always, incentives are fundamental to encourage your contacts to give you new and updated information: this could be a prize contest, a coupon or any incentive that would best motivate your recipient. Lastly, transparency is another key factor: Always explain the purpose of your request, perhaps putting the emphasis on the benefits your recipients will receive. Remind them, for example, that by providing their date of birth, they can receive a coupon or voucher on their birthday. Profiling always has good reasons also for the recipient: better mutual understanding ensures better and truly relevant campaigns.